I gave a talk at the Saguaro Astronomy Club (established in 1977) on “Presolar Grains – Connecting Laboratory Studies to Stars”. See “http://saguaroastro.org/&#8221; to learn about the club and its operations. Ziliang and Jack delivered excellent talks at the 50th Lunar and Planetary Science Conference in Houston. Below is Ziliang talking about water in S-Type asteroids. Three undergraduates with diverse backgrounds and research interests joined my lab this Spring. Check out their profiles on the CIA members page. Welcome Victoria, Ethan, and Tom! I was invited to talk at the Institute for Geophysics and Planetary Physics Seminar at University of California, Santa Cruz on 16th November 2018. I talked about “How extraterrestrial dust grains constrain the early history of the solar nebula”. I enjoyed the trip and was mesmerized by the beautiful Santa Cruz campus with tall redwood trees. Showcasing the NanoSIMS at the Knowledge Enterprise Development Core symposium on 6th November 2018. Talk on Stardust at the “Contemporary Women in the Physical Sciences” event on 19th October 2018. I was selected to attend the Sample Handling Workshop at Johnson Space Center, TX from 15-17th October. Worked with several pieces of equipment. Took tours of Class 10, 100, 1000 clean labs. The School of Earth and Space Exploration (SESE) at Arizona State University (ASU) invites applications for a Postdoctoral Scholar in Isotope Cosmochemistry and Planetary Science. Applications are invited for one postdoctoral position to work in collaboration with Dr. Maitrayee Bose and Dr. Richard Hervig. The NSF supported National SIMS Facility at ASU has an opening for a prestigious Postdoctoral Scholar position. 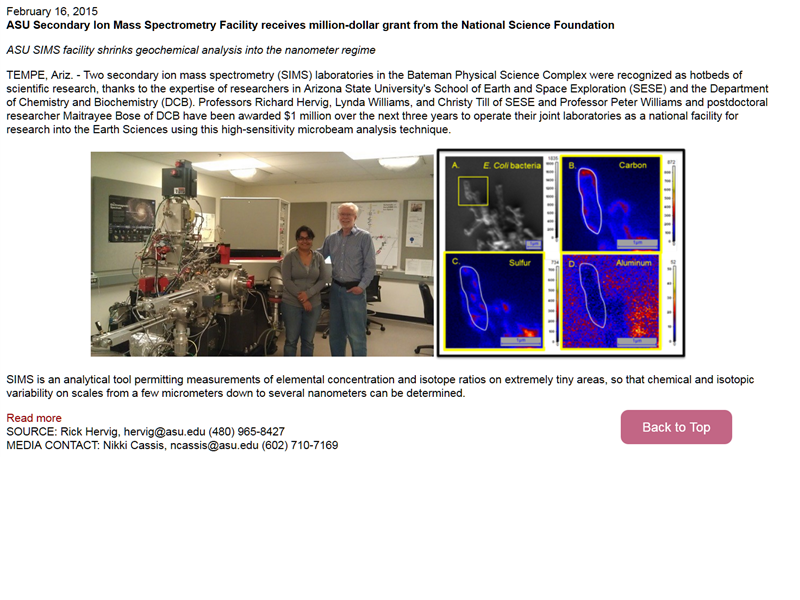 The NanoSIMS laboratory, part of the ASU-SIMS facility, is used by a wide range of users in cosmochemistry, geology and geochemistry, microbiology and engineering. We are looking for candidates who aim to develop NanoSIMS methodologies that can advance the analytical capabilities of the instrument. The postdoc can work with Drs. Maitrayee Bose and Richard Hervig on a variety of NanoSIMS applications. The other responsibilities of the candidate will include helping users perform analyses of planetary, volcanic samples or biological samples. The candidate is expected to assist in routine maintenance and repair of the electronic, vacuum and software components with the help of Cameca service engineers. Early expressions of interest and inquiries can be sent directly to mbose2@asu.edu. The initial appointment is for one year with subsequent annual renewal for up to two additional years contingent upon satisfactory performance, the needs of the university, and availability of resources. The start date is 15th January 2019 and is negotiable. This position comes with a competitive salary and a full health insurance coverage. Minimum qualifications include a Ph.D. in Physics, Chemistry, or Geology by the start date. Experience in Secondary Ion Mass Spectrometry (NanoSIMS, xf series, or 1270 series) is mandatory. Candidates should possess excellent communication, organizational and interpersonal skills. Desired qualifications include a background in isotopic analysis of terrestrial and planetary materials using NanoSIMS. Candidates must be within five years from receipt of the doctoral degree. 1. A cover letter that states why we should hire you and the research problem you would like to work on during the 3-year period. 2. Please ask 3 references to email their letters to mbose2@asu.edu. 3. A curriculum vitae with a publication list. Jasmine Garani will become a member of CIA from August 2018. She joins SESE with a bachelor’s degree in physics and astronomy from Stony Brook University. During her undergrad, she analyzed images from the Keck Telescope and NIRC2 instrument in Hawaii to identify brown dwarfs that potentially harbor exoplanets. She will study stardust and volatiles in meteorites for her graduate research. Welcome Jasmine! My PhD adviser and a dear friend, Christine Floss died unexpectedly on 19th April. I am deeply saddened by her loss. The cosmochemistry community will always remember her scientific accomplishments (https://bit.ly/2HyduBW). A personal tribute to this wonderful human being can be found here: https://bit.ly/2HxnDdZ. Jack Schlute became a member of CIA in March 2018. His research will focus on supernova modeling of presolar grains. Members of CIA had several presentations at the Lunar and Planetary Science Conference 2018. Ziliang Jin presented an excellent talk about water on Itokawa resulting in a lively discussion. See snapshots of tweets by microbloggers who highlighted the results. I presented two posters, one on diffusion dating of presolar grains and the other on identifying thiols (-SH) in situ of a carbonaceous chondrite. The former poster (https://www.hou.usra.edu/meetings/lpsc2018/eposter/1524.pdf) received considerable attention from the community. 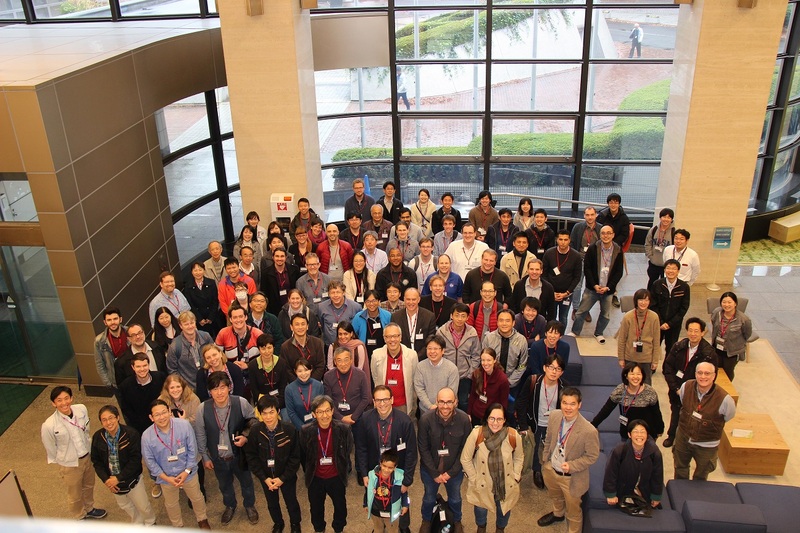 Pictures from the 10th ASU SIMS workshop from 3-5 January 2018. Drs. Richard Hervig and Zan Peeters giving demonstrations on the ims 6f and NanoSIMS 50L. Dr. Zan Peeters joined my lab in SESE as an Assistant Research Scientist and NanoSIMS lab manager in October 2017. Dr. Ziliang Jin joined my lab in SESE as a Postdoctoral Researcher in September 2017. His research work will focus on the study of volatile elements in anhydrous minerals from the asteroid Itokawa and other chondritic samples using the NanoSIMS 50L. Physicist, wine-maker, and friend Chris Loxton presented a talk titled “The science and art of wine-making” at the SESE colloquium on 11th January. Hayabusa I, a JAXA mission to an asteroid Itokawa, was the first successful sample return mission from an Ordinary chondrite. Grains collected during this mission arrived Arizona State University for isotopic analysis on 9th January.